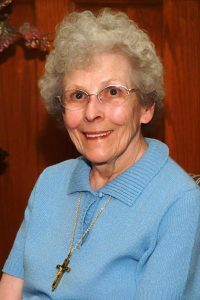 Sister Therese Richstatter died April 13, 2018 at Mount Joseph Senior Village in Concordia, Kan. She was 88 years old and a Sister of St. Joseph for 68 years. She was born in Clay Center, Kan., on Dec. 21, 1929, to Edward and Martha Klemm Richstatter, the younger of two children, and was baptized Anna Elizabeth. She entered the Sisters of St. Joseph of Concordia on Sept. 7, 1949. On March 18, 1950, Anna received the habit of the Sisters of St. Joseph and was given the name Sister Therese. She pronounced first vows on March 19, 1951 and final vows on March 19, 1954. Sister Therese received a BA in English from Marymount College in 1967 and a MA in Theology in 1972 from St. Mary’s University in San Antonio, Texas. She taught in schools staffed by the Sisters of St. Joseph in Chicago, Ill., Grand Island, Neb., Boonville, Mo. ; in Tipton, Salina, Leawood, Manhattan, Oakley, Plainville, Beloit in Kansas; and in El Paso, Texas. Upon retiring from teaching, she served as librarian at the Sacred Heart Grade School, Salina, and Our Lady of Guadalupe School, Topeka, Kan.. In 2004, she retired to the Motherhouse and in 2013 she moved to Mount Joseph Senior Village in Concordia. Sister Therese was preceded in death by her parents and older sister. A Bible Vigil Service will be held at 7 p.m. April 16 in the Nazareth Motherhouse Chapel with Sister Marilyn Wall as the eulogist. The Mass of Christian Burial will be 11 a.m. April 17 at the Motherhouse Chapel with Father James Hoover presiding. The burial will be in the Nazareth Motherhouse Cemetery. Chaput-Buoy Mortuary, 325 W. 6th St., Concordia, Kan., is in charge of arrangements.